Recycle those paper bookmarks you get for free at the bookstore. Chuck those decrepit woven things you’ve kept since childhood. Take a few minutes to crochet yourself a simple, elegant book thong that will make you feel like the sophisticated intellectual you know you are. When you make a chain, the front looks like a series of Vs (and each V has a top and bottom loop) and the back looks like a series of bumps that forms a spine or ridge. 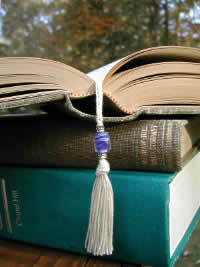 You’re starting at the bottom (tassel end) of the bookmark. Leave a long tail, about 12 inches, because you’ll need room to do a little stitching with it later. Chain 150. 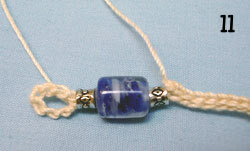 Thread your top bead (the bead you’ve chosen for the non-tassel end of the bookmark) onto the chain from the tail end and bring it close, but not all the way, to the working end. Working back down the chain on the other side of the bead, inserting your hook through both the top loop and back ridge (Figure 2), sl st into a chain stitch that will allow the chain to wrap gently and snuggly around the bead (Figure 3). (Note: Inserting through both the top loop and back ridge on this ch makes the joining near the bead more secure.) Sl st, inserting your hook through the back ridge only, in the next ch and in each ch across until you have about three inches of chain left. 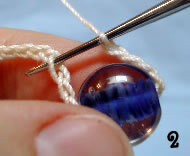 Remove your hook and place a stitch marker to hold the last stitch (you’ll come back to this later). 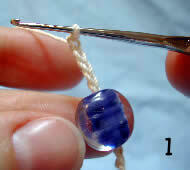 Thread th e rest of your beads on from the tail end and push them up to the stitch marker (Figure 4). 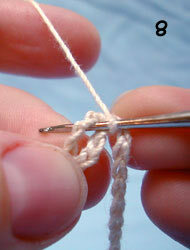 Insert your hook in the 8th chain from the tail (Figure 5) and pull the tail through to form a ring (Figure 6). Insert your hook through the same chain and pull the tail through again, pulling it gently snug to secure it. 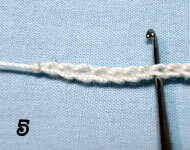 Insert your hook through the same chain a third time and pull the tail through, leaving a loop rather than pulling it tight; insert your hook in the loop (Figure 7), sc into the ring (Figures 8 and 9), and finish off. 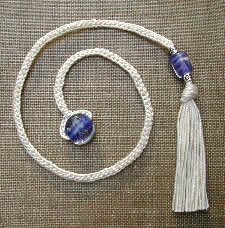 The ring just made is where you will insert the tassel later. Push your beads down to the sc just made (Figure 10). Remove the stitch marker and continue to sl st in the back ridge of each chain until you reach the beads, and finish off. (Figure 11). Work in ends with a needle. Cut 16 pieces of thread, each 8 inches long. 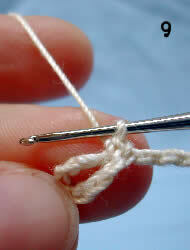 Holding all strands together, fold in half, insert J hook into ring and draw the fold through, draw the loose ends through the loop made by the fold and gently tighten. Trim evenly to desired length. The author has licensed this page under a Creative Commons License. Some rights reserved.